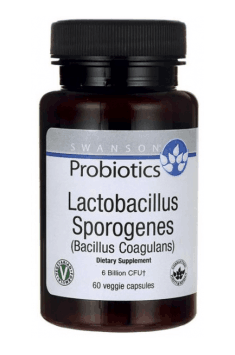 Swanson Lactobacillus Sporogenes (Bacillus Coagulans) is a dietary supplement containing live cultures of probiotic bacteria Lactobacillus sporogenes (Bacillus coagulans). One capsule contains 6 billion CFUs. The preparation is intended to supplement the bacterial flora of the intestines with useful bacteria and improve digestive processes. Specially designed capsules do not require refrigeration. The package contains 60 capsules, suitable for vegans and vegetarians. Bacillus coagulans is a species of probiotic bacteria that was for the first time isolated from milk. B. coagulans is a Gram-positive, relatively anaerobic rod, resistant to adverse environmental conditions, which is why it is commonly found in nature. It is capable of moving and producing endospores. As a result, B. coagulans is resistant to gastric and bile acids, which allows them to enter the large intestine without any major losses. B. coagulans belongs to the group of lactic bacteria (LAB), i.e. bacteria capable of producing lactic acid due to the fermentation of glucose. Owed to a low pH, Lactic acid promotes the growth and development of undesirable, potentially pathogenic microorganisms in the gastrointestinal tract and creates the optimal environment for the development of beneficial lactic acid bacteria. B. coagulans can protect the body against pathogenic microorganisms. Therefore, it can be a valuable element of health prophylaxis. It has been shown that certain strains of B. coagulans display antibacterial activity against some dangerous pathogenic bacteria, including Clostridium difficile, Clostridium perfringens and Listeria monocytogenes. B. coagulans supports the improvement of digestive comfort on the go. Changing of the environment or food, associated with traveling, especially to exotic spots, pose a greater risk of infection, digestive problems, and diarrhea. Probiotic bacteria support the balance of intestinal microflora in new conditions, improve the tolerance of food products and reduce digestive disorders. B. coagulans is a frequently used probiotic in against diarrhea, including traveler's diarrhea, which has been proven in clinical trials (for specific strains). B. coagulans can be helpful in relieving symptoms of irritable bowel syndrome (IBS). A randomized, placebo-controlled trial was conducted on 85 patients suffering from IBS. The research group for 12 weeks received B. coagulans-based symbiotic preparation. Then, the possible changes in the intensity of unpleasant symptoms associated with IBS were assessed. It turned out that patients receiving B. coagulans had significant alleviation of stomach pain and diarrhea. B. coagulans supports the balance of intestinal microflora, which results in strengthening of the body's immunity. Probiotic bacteria reduce the access of pathogenic bacteria to the mucous membrane and stimulate the secretion of mucin, a substance with the protective effect on the intestinal mucosa. The intestinal mucosa is a defensive barrier against pathogens, and its condition determines the immune response of the body to a given factor. Intestines play a huge role in the body's immunity – over 70% of cells of the human immune system are associated with the lymphatic tissue of the intestinal mucosa. This is so-called GALT (Gut Associated Lymphoid Tissue), controlling, among others, immune response to gastrointestinal microorganisms as well as prevention of allergies and food intolerances. In conclusion, Swanson Lactobacillus Sporogenes (Bacillus Coagulans) is a dietary supplement supporting the restoration and maintenance of the intestinal microflora balance. The product is recommended in digestive ailments, diarrhea of ​​various origins, during travel and to relieve the symptoms of IBS and strengthen the immune system. Lactobacillus Sporogenes (Bacillus Coagulans) 60 caps. Preparations containing live bacterial cultures should not be taken with hot drinks and meals. In order to strengthen the activity of probiotic bacteria, it is worth reaching for prebiotics or consuming prebiotic food, i.e. products rich in dietary fiber. Prebiotics provide nutrients for beneficial bacteria, which results in supporting the growth of beneficial intestinal flora. Microcrystalline cellulose (plant fiber), hypromellose (vegetable capsule), maltodextrin, silica, rice extract. Lactospore (Lactobacillus sporogenes), a strain of bacteria, one of the most important probiotic active in the gastrointestinal tract, increasing the digestibility of foods, elimination of the effects of disorders and food poisoning. Affecting the body's immunity and bowel function by stimulating the growth of Biffidiobacterium bacteria. Slows the growth of bacteria affecting negatively on the body (including the type of Crostridum). It is a component of dietary supplements for health, stimulating the digestive system (prebiotic, probiotics and functional preparations) and as a component of various types of nutrients available to www.muscle-zone.pl.